The tension in the room is palpable. Well, not really. For one thing, I’m the only one here. For another, I just woke up an hour ago, and it takes me at least 3 hours before I’m able to function at normal levels of emotion. But still. Palpable. Because I like that word. This was the biggest giveaway I have ever hosted. It’s the biggest prize, and it had the most number of entries. We had 23 unique contestants, with a total of 93 individual entries! 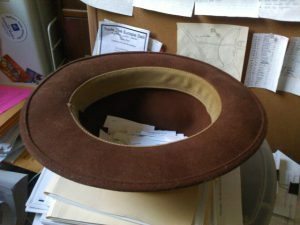 Due to the size of this giveaway, I thought it deserved better treatment than the usual “random.org” selection, so I created slips of paper for each entry and tossed it into my legendary writing fedora (which some of you might remember from that long ago first interview). To bring even another level of pageantry to the drawing, I shot video of it! I know, how fancy. But let me remind you, I just woke up when I decided to do this, so I don’t sound particularly excited. Also, my phone only takes 30 seconds of video at a time, so it’s a little rushed. I had a blast during the Coffin Hop this year. To all my new followers, thank you for giving my little site a chance, and for reading some of my work. Stick around a while. I have my first novel coming out very soon, and new stories being released all the time. Plus I’ve already signed on to take part in the Christmas Hop in December! More prizes, more fun (this time without the spiders and eye balls).